Prince Harry shared a behind-the-scenes detail about his wedding day with Meghan Markle, but this one has to do with Prince Charles. 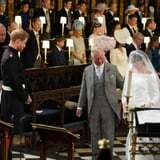 During an interview for BBC One's documentary Prince, Son and Heir: Charles at 70, Harry opens up about the sweet response he received from his dad when asked to walk Meghan down the aisle. ICYMI, back in May, there was quite a bit of controversy surrounding who would fill that role at the royal wedding. Speculation circled over who would accompany Meghan when her father, Thomas Markle, announced he would not be attending the wedding after experiencing a health scare and a photo scandal surfaced. According to People, during the documentary, Harry reveals what Charles said when approached with the task. "I asked him to and I think he knew it was coming and he immediately said, 'Yes, of course, I'll do whatever Meghan needs and I'm here to support you,'" Harry recalled. "For him that's a fantastic opportunity to step up and be that support, and you know he's our father so of course he's gonna be there for us." Aw! Charles stepped up to the plate to be there for his son and daughter-in-law, and it's likely this kind gesture made his bond with Meghan even closer. Tune into BBC One on Nov. 8 for the full documentary, a rare peek into the famous royal's life.